This recipe is the love child of one very tired mama and an alarming lack of time and energy one cold, snowy Wednesday eve. If you’ve had a bad day like me, the great smell around the house and the sight of children licking their bowls will cheer you up. Lack of dishes doesn’t hurt either. 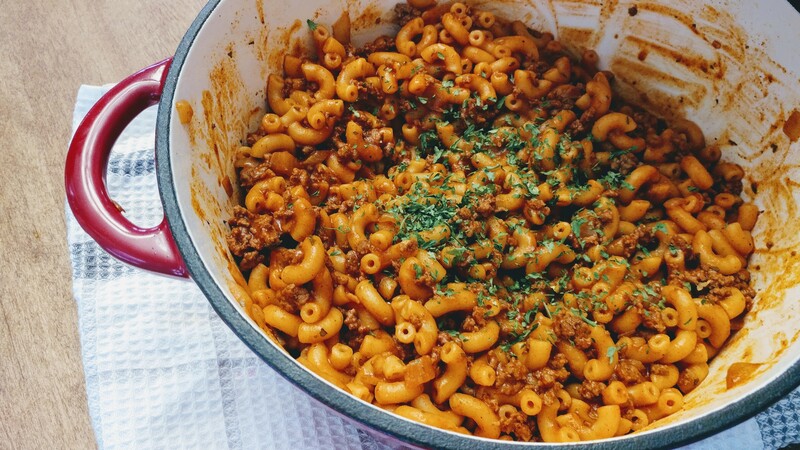 One pot pasta is an easy, cheap and quick meal, and with the exception of 1 raw onion and the meat, all the ingredients are basic pantry items. My pot of pasta fed 4 hungry children, alongside some cut veggies. If you feed a bigger crowd, just double the recipe. 400 grams (about 3 cups) short pasta variety. I usually go for macaroni. 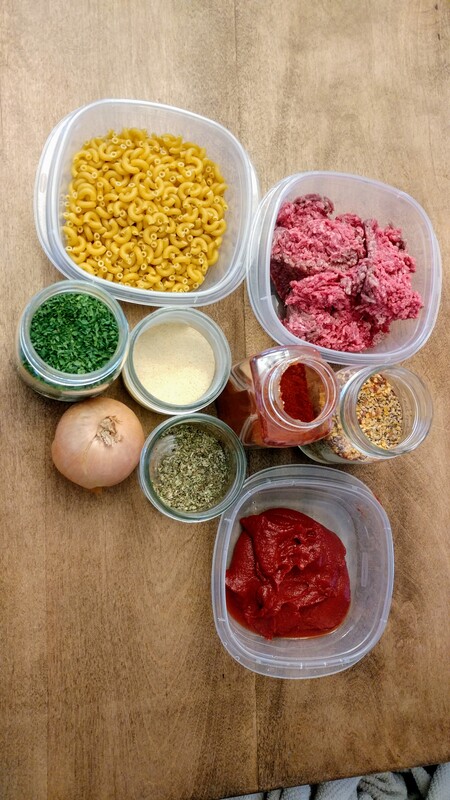 1 tsp of each dry spice: garlic powder, paprika, steak spice, oregano, parsley. Heat oil in a medium heavy pot and add the chopped onion. Stir fry until the onion begins to golden slightly around the edges. Add meat to the hot oil in one chunk and let the bottom get nice and charred. Flip it and brown the other side, add spices and stir fry until no longer raw. Add water, tomato paste and more salt if necessary and mix well. Lower heat to low, cover and cook for 25 minutes, stirring occasionally so that the pasta doesn’t stick to the bottom. Serve hot, with freshly chopped parsley or basil if you feel fancy, or just ladle into bowls and look around the table at the happy, red stained faces.